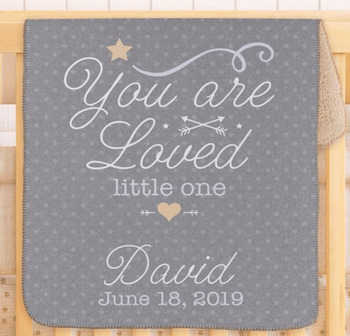 This super-soft, "You Are Loved Little One," Sherpa blanket will be an instant keepsake once personalized for posterity. We add the child�s name and, if desired, date of birth. The receiver of the gift is delighted. Thank you very much! The receiver of the gift is delighted. Whoever made the blanket did a fantastic job. !